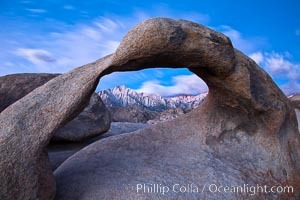 Mobius Arch at sunrise, framing snow dusted Lone Pine Peak and the Sierra Nevada Range in the background. 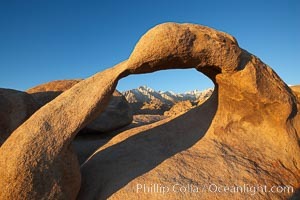 Also known as Galen's Arch, Mobius Arch is found in the Alabama Hills Recreational Area near Lone Pine. Moebius Arch Photo. 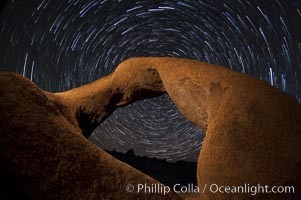 Mobius Arch in the Alabama Hills, seen here at night with swirling star trails formed in the sky above due to a long time exposure. Moebius Arch Picture. 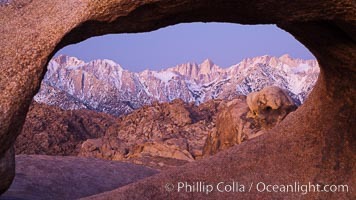 Mobius Arch at sunrise, with Mount Whitney (the tallest peak in the continental United States), Lone Pine Peak and snow-covered Sierra Nevada Range framed within the arch. 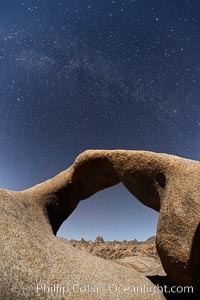 Mobius Arch is a 17-foot-wide natural rock arch in the scenic Alabama Hills Recreational Area near Lone Pine, California. Stock Photography of Moebius Arch. Mobius Arch at sunrise, framing snow dusted Lone Pine Peak and the Sierra Nevada Range in the background. 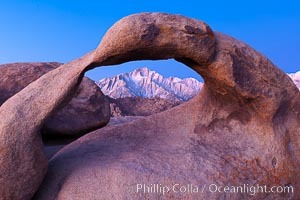 Also known as Galen's Arch, Mobius Arch is found in the Alabama Hills Recreational Area near Lone Pine. Photograph of Moebius Arch. 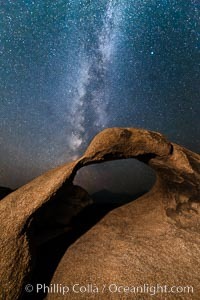 Milky Way galaxy over Mobius Arch at night, Alabama Hills. Moebius Arch Photos. 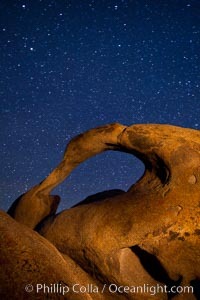 Mobius Arch and stars at night, Alabama Hills, California. Moebius Arch Image. 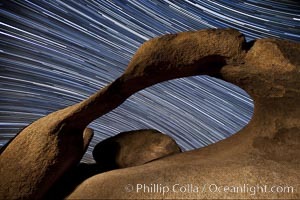 Mobius Arch in the Alabama Hills, seen here at night with swirling star trails formed in the sky above due to a long time exposure. Professional stock photos of Moebius Arch. Mobius Arch in golden early morning light. 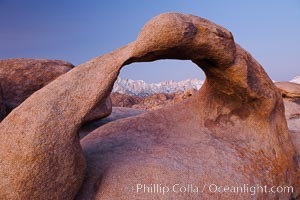 The natural stone arch is found in the scenic Alabama Hlls near Lone Pine, California. Pictures of Moebius Arch. 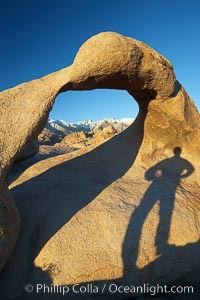 The long shadow of a hiker lies on Mobius Arch, a natural stone arch in the Alabama Hills. Moebius Arch Photo. 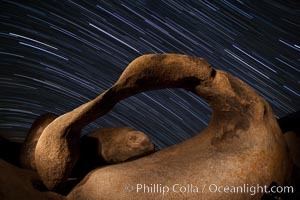 Mobius Arch in the Alabama Hills, seen here at night with swirling star trails formed in the sky above due to a long time exposure. Polaris, the North Star, is visible at upper right. Moebius Arch Picture. Mobius Arch at sunrise, framing snow dusted Lone Pine Peak and the Sierra Nevada Range in the background. 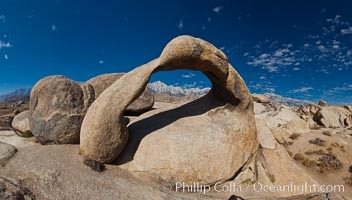 Also known as Galen's Arch, Mobius Arch is found in the Alabama Hills Recreational Area near Lone Pine. 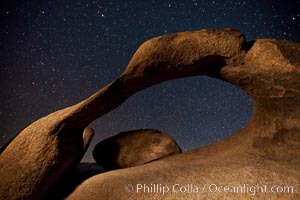 Stock Photography of Moebius Arch. 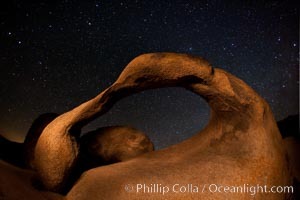 Mobius Arch with the Milky Way galaxy appearing in the night sky above. Photograph of Moebius Arch. 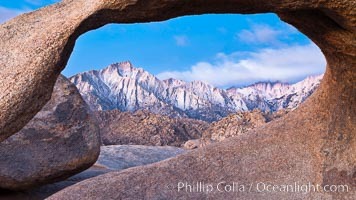 Mobius Arch panorama, with Mount Whitney (the tallest peak in the continental United States), Lone Pine Peak and Sierra Nevada Range framed within the arch. 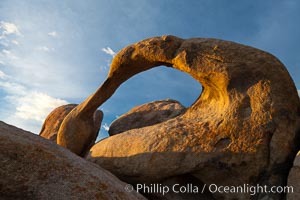 Mobius Arch is a 17-foot-wide natural rock arch in the scenic Alabama Hills Recreational Area near Lone Pine, California Moebius Arch Photos. 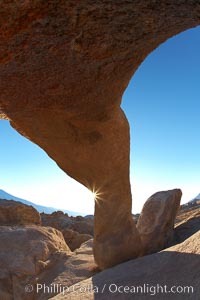 Mobius Arch in golden early morning light. 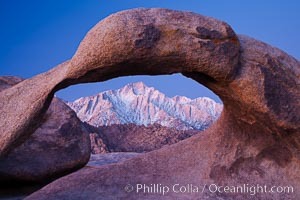 The natural stone arch is found in the scenic Alabama Hlls near Lone Pine, California. Moebius Arch Image. Mobius Arch at sunrise, framing snow dusted Lone Pine Peak and the Sierra Nevada Range in the background. 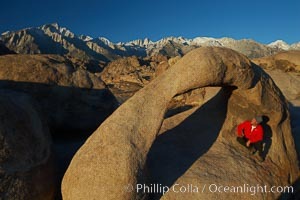 Also known as Galen's Arch, Mobius Arch is found in the Alabama Hills Recreational Area near Lone Pine. Professional stock photos of Moebius Arch. 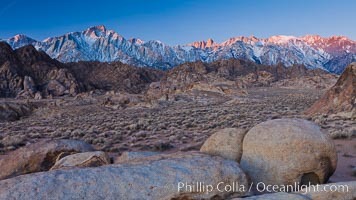 Mobius Arch at sunrise, framing snow dusted Lone Pine Peak and the Sierra Nevada Range in the background. 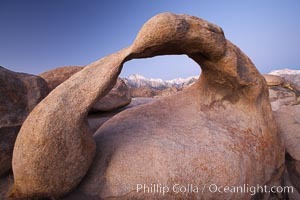 Also known as Galen's Arch, Mobius Arch is found in the Alabama Hills Recreational Area near Lone Pine. Pictures of Moebius Arch. Mobius Arch at sunrise, framing snow dusted Lone Pine Peak and the Sierra Nevada Range in the background. 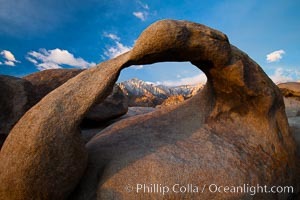 Also known as Galen's Arch, Mobius Arch is found in the Alabama Hills Recreational Area near Lone Pine. Moebius Arch Picture. 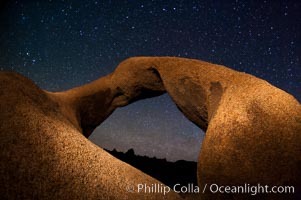 Mobius Arch and stars at night, Alabama Hills, California. Stock Photography of Moebius Arch. 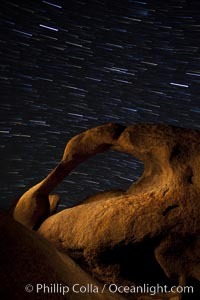 Mobius Arch in the Alabama Hills, seen here at night with swirling star trails formed in the sky above due to a long time exposure. Photograph of Moebius Arch. 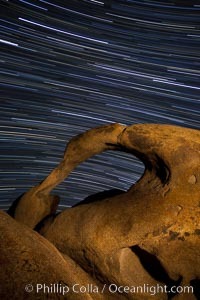 Mobius Arch and stars at night, Alabama Hills, California. Moebius Arch Photos. Alabama Hills and Sierra Nevada, sunrise. Moebius Arch Image. Mobius Arch, sunrise. Pictures of Moebius Arch. 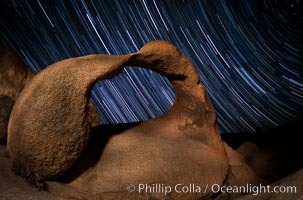 Mobius Arch in the Alabama Hills, seen here at night with swirling star trails formed in the sky above due to a long time exposure. Moebius Arch Photo. 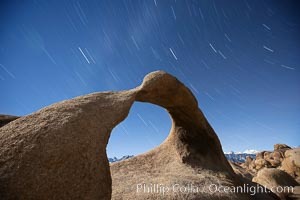 Mobius Arch in the Alabama Hills, seen here at night with swirling star trails formed in the sky above due to a long time exposure. Stock Photography of Moebius Arch. A hiker admires Mobius Arch in early morning golden sunlight, with the snow-covered Sierra Nevada Range and the Alabama Hills seen in the background. Moebius Arch Photos. Mobius Arch at sunrise, framing snow dusted Lone Pine Peak and the Sierra Nevada Range in the background. 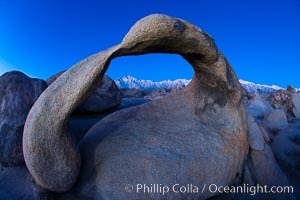 Also known as Galen's Arch, Mobius Arch is found in the Alabama Hills Recreational Area near Lone Pine. Moebius Arch Image.